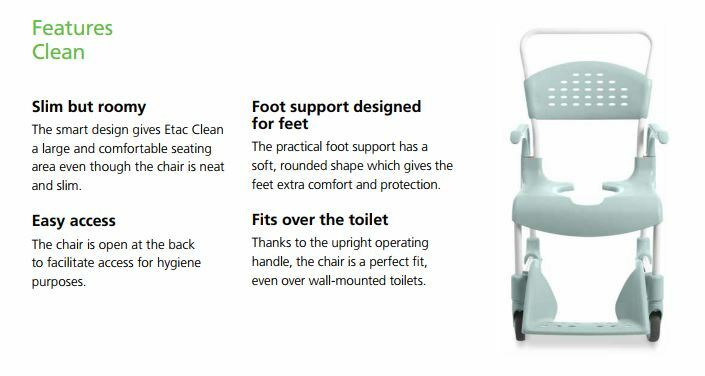 Soft padded cover for Etac Clean shower chairs. Add softness and comfort with this water repellent and heat reflective soft shower chair seat cover. Covers open seat area for users who want a full padded seat. Safety strap attaches on the rear side of the back supports. Soap dish attaches to the side of the seat of any Clean Shower Chair except for the Clean 24. Includes shower head holder. Cross bar for ETAC Clean Shower Chair attaches to the arm supports to assist with keeping user in the chair. One of the best shower chair accessories. Soft contoured seat for Etac Clean Shower Chair. Side supports for Etac Clean Shower Chair support users upper trunk. Attached by velcro, these side supports are super easy to remove and attach.